Gus and Balon had a beautiful wedding in September of 2015 in Ellicottville, NY. The ceremony and reception were located at Holiday Valley Resort. They had a lovely outdoor ceremony and then we did photos with the wedding party right on the grounds. We did their engagement session the year before at Knox Farm State Park. Balon loved the Fall. We usually like to do opposite season for engagement shoots to give contrast to the wedding day. We do not like it to look like we did all the photos in a week. But, we helped them select a location that would help stay with their outdoor theme, but look different than the wedding day. 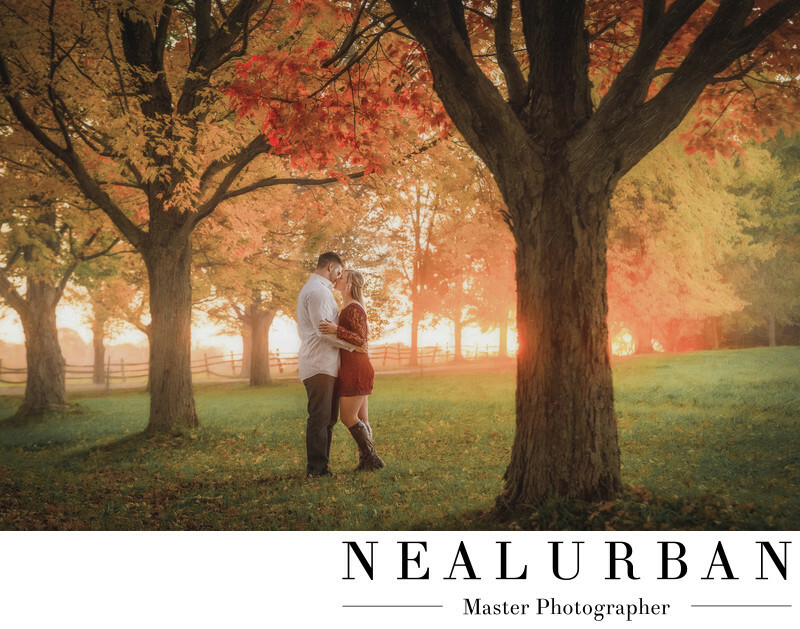 Knox Farm was the place to be the day of their engagement session. Everything about this image just works and is gorgeous. Gus and Balon had great outfits too! They matched the scenery and made complete sense for the location. Sometimes outfits do not always make sense. We try to help and give advice to our couples when planning locations and outfits. We want them to love their photos! We want them to look back and say, I would not change a thing! The foliage was amazing for this photo shoot. The colors were so pretty. Balon's dress compliments the leaves so good! The sun was starting to set here. We actually ran to this location at the Park to get this perfect shot! The sky in the back ground looks likes it was on fire. I love how it washes out the wooden fence, but you can still see it. The tree in the foreground helps to frame in the lovely bride and groom to be. The leaves on the ground provide some nice texture to the image too! Overall, Gus and Balon's engagement session was a perfect shoot from start to finish! This was a great start to prep us for the wedding day in Ellicottville, NY!